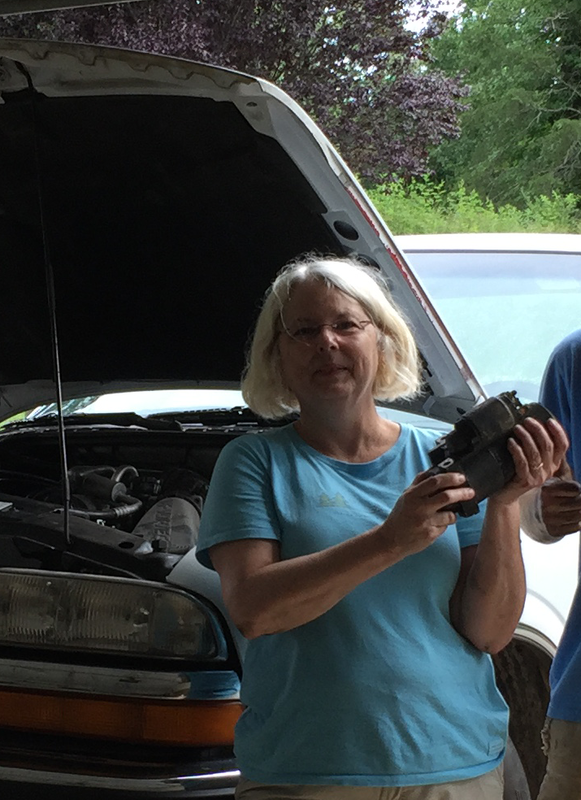 Carolyn is a maker and fixer who is comfortable dismantling car engines! At the beginning of the last school year, I wrote to tell you that I was leaving the EESC to chase other adventures and explore new realms of creativity. Finding a successor wasn’t easy. The next director had to be passionate about engineering education, resourceful, ambitious, upstanding, dependable, technologically savvy, and just all around a good person. After much talk with many people, I found Carolyn Helm. She is the perfect fit to carry the torch and make it burn brighter. She has what it takes to expand the activities, books, workshops, kits, fun stuff and everything else that will make the center a fantastic resource for everything related to engineering and STEM education. Carolyn Helm has worked for the Southern Regional Education Board for the past 18 years. She helped to develop and grow Project Lead The Way from programs in 23 schools to thousands of middle and high schools across the country. Her current focus is assisting career and technical teachers and administrators to develop and sustain problem-based instruction and institute research-based best practices in CTE schools. Early in her career Carolyn designed facilities, curriculum models, and operational plans for both high school and middle school Model Engineering Academies. In fact, her granddaughter attended one of the middle school academies and decided to become an engineer! Carolyn’s variety of professional experiences such as electrical estimating and manufacturing engineering, along with her graduate degree in Educational Leadership as well as her innate love of “making things work” have made her uniquely qualified to take the helm at the Engineering Education Service Center. You’ll still hear from me about once a month for most of this upcoming school year and you can still ask me questions about engineering careers. I’m leaving you in very capable hands. Have no fear, Carolyn is here! This blog today is about never letting others hold you down or convince you to give up the dream. In 1998, my last year in engineering school, I wrote a book about going to engineering school and choosing a discipline to study (mechanical, electrical, civil, etc.) Because no one would publish it, I formed a publishing company and did it myself. I had no idea what I was doing but simply believed with all my heart and soul that anyone who wanted to go to college for engineering needed my book. About six months after publishing the book, the phone rang and to my great surprise, the caller ID said NASA. I tentatively answered the phone thinking they must have the wrong number, but no – they asked for me. They told me they loved my book and wanted to give it to everyone. From that moment on, all I had to do was figure out how to ramp up and hang on because I had lift-off. The book quickly became the #1 engineering career guide at Amazon and book publishers were now coming to me. During that time, I received rejection notices from publishers, the Dean of the college refused to write a foreword and other students seemed less than interested. But, I knew there was nothing like it and that it would’ve been the perfect reference when I was making the decision to study engineering. With only a gut feeling, I sent it out into the world. Eighteen years later, it is in its fifth edition and now covers 45 types of engineering and engineering technology. About 80,000 copies are in print and Chinese and Asian (India) editions were published last year. It is a testament to believing in yourself and your power to see and contribute to a better future. You may never know who, exactly, you are helping but I guarantee you will sleep well at night if you follow your heart and promote (do!) something good. For the last 18 years, I’ve worked tirelessly to promote engineering education by showing it as a way to change the world, the best education available, and a viable career option for girls and boys. In this pursuit, I’ve authored 22 books, published three videos, and founded the Mother/Daughter TEA (Technology Engineering Aptitude) workshop. I’ve run contests for engineering posters, engineering music, and engineering curriculum. I’ve given keynotes and presentations at over 100 colleges, universities, schools, events and conferences. I’ve won five awards for this work and in return, I’ve traveled to every state and experienced the joy of having a custom-made career that gives back. I’m truly blessed and so thankful for the opportunities provided and for the people I have met along the way. But now the time has come for a new adventure. I’ve decided to chase the Celeste Watch Company dream to see where it will take me. I will be dismantling the EESC over the rest of the school year. Up until July 2017, I will still be available to facilitate the Mother/Daughter TEA workshop, the Engineering Exploration Day and all of my other teacher trainings. If you want to hold any of these events in the Spring, now is the time to get on my calendar. However, it is my hope that the Mother/Daughter TEA workshop will find a new home this summer with educators who can fan the fire by traveling to hold TEAs and offering Train-the-Trainer workshops. It is my hope that an educator somewhere who wants to earn side-money will take over the inventory of C’s Blast Packs and offer these turn-key solutions as a way to help schools promote engineering. And it is my hope that the work I’ve done has made a difference in your perspective or career. If you are interested in running with the torch, don’t hesitate to drop me an email. This Fall, you can get copies of Is There an Engineer Inside You?, the leading book on engineering and engineering technology career information, with your logo on the front and back covers for up to 70% off the retail price and support a good cause at the same time. We only offer this discount in August to take advantage of volume pricing. If you have you been trying to introduce more students to engineering or trying to recruit more students into your program, this is a great opportunity for you to save time and money. The fourth year of the 100,000 Book Give-Away Program is on the horizon. The goal of the program is to give away 100,000 books to students, teachers, and school counselors over a five year period. Each partner will receive 300+ books with their logo on the front and back covers. Each partner will receive a customized pdf copy for their website. Books are only $7.35 each! That’s over 70% off! There is no other cost saving opportunity like this and it’s only offered once a year. Each partner’s website will be included on the cover page of the website edition and in the acknowledgements of the print edition. After the initial printing, partners can purchase additional books (no logo) for only $5 each. Piggyback on a National Media Campaign and gain greater exposure for your program(s). This year, as part of the Book Give-Away Program, a 5th Edition will be released! Right now, the book covers 41 types of engineering. The 5th edition will cover 45 types and also include expanded sections on women and minorities in engineering. By partnering with Universities and organizations who want to promote engineering careers and motivate students to pursue engineering, to date, we have given away close to 50,000 copies! Books have been donated to schools, libraries, guidance counselors and teachers; distributed at engineering competitions, events, conferences and workshops; and are available as downloads from some partner websites. Is There an Engineer Inside You? can reinforce your message by building on the information you share about what engineers, technologists and technicians do, helping explain the differences between engineering and engineering technology, and showing that engineering and engineering technology are degree paths that can lead to fulfilling careers. For the first time, you can also now order smaller quantities of Is There an Engineer Inside You? with your logo on the front and backs covers at a discount by joining in the printing in August. Early Bird Bonus – This renewal offer is coming early to help me manage the program. With 300+ requests for free books last year, I was overwhelmed. To give you an incentive to help, if you renew or join by June 5, you will receive an extra 10 books at no additional cost! We only have two years left and 50,000 books to go! Become a partner today and by working together, we can ensure that every K-12 student has this valuable resource with your branding front and center. It’s a win-win. Have you been trying to introduce more students to engineering or technology? Have you have been trying to recruit more students into your program? Have you wanted to share information about what engineers, technologists or technicians do? Do you regularly explain the differences between engineering and engineering technology? If you nodded in agreement to any of these questions, the 100,000 Book Give-Away program can help you save time and reach your goals. If you think that engineering and technology are degree paths that can lead to fulfilling careers, this program will reinforce your message. Year four of the 100,000 Book Give-Away program is on the horizon. 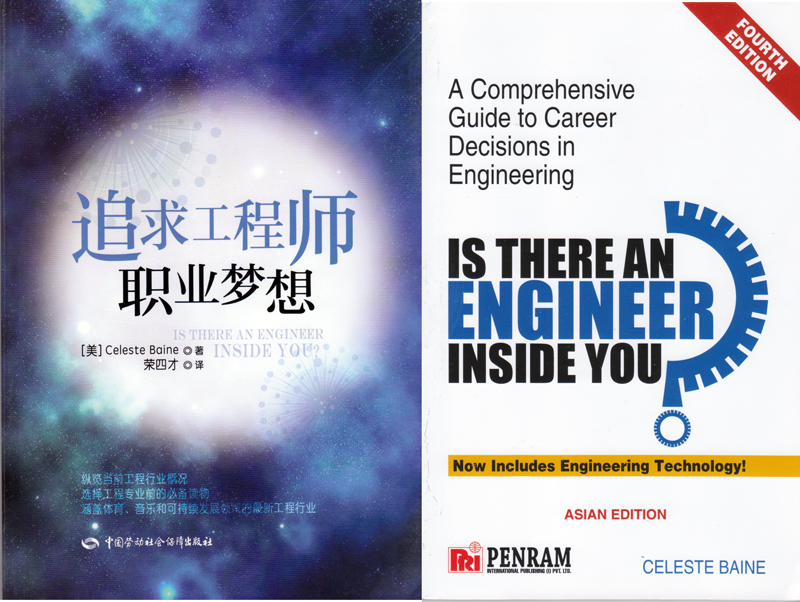 The goal of this five-year program is to give away at least 100K copies of Is There an Engineer Inside You?, the leading career guide for engineering and engineering technology. By partnering with Universities and organizations who want to promote engineering careers and motivate students to pursue engineering, to date, we have given away close to 50,000 copies. Books have been donated to schools, libraries, guidance counselors and teachers; distributed at engineering competitions, events, conferences and workshops; and are available as downloads from some partner websites. The 100K Book Give-Away is an amazing program designed to help you easily expand your outreach, save money, save time, and provide a proven reference to students, parents, educators, counselors and mentors in your community. Deadline to become a partner is August 8, 2016. I’m back in Eugene after several wildly successful days of training teachers and inspiring students in Tulsa, Oklahoma. 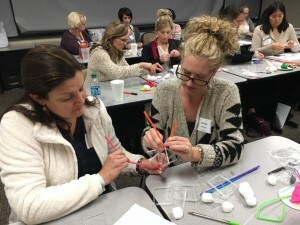 I trained 23 new teachers to hold Mother/Daughter Engineering Days. The Engineering Day, or TEA (Technology Engineering Aptitude) workshops, are designed to allow 40 middle school girls and their moms to do hands-on building projects together and learn about engineering careers and opportunities. If you follow my work, you know that this is the best workshop I have ever seen for getting girls interested in engineering. In all, Oklahoma now has 76 certified TEA (Technology Engineering Aptitude) trainers! The day following the TEA training, I held an advanced TEA training so the trainers could experience additional activities and find even more ways to excite girls about pursuing an engineering or STEM career. We completed five additional hands-on activities and shared implementation strategies. The advanced training was developed to help middle and high school educators with no engineering background build upon the activities previously facilitated in a TEA. The advanced training is ideal for those who want to continue working with a select group of mothers and daughters. We followed-up these two trainings with a Mother/Daughter TEA event on Saturday. Attended by 26 families, the girls and moms moved through the activities while the teachers simultaneously observed, participated and cemented their knowledge on holding TEAs. This was the best scenario for any certified trainer because they are ready to hit the ground running. Not only are they comfortable with the activities and event organization but each school left the training with a toolkit of materials to hold their own events. All of the materials, handouts, prizes and instructions are included. To make the best use of my time, I also gave the lunchtime keynote to 400 girls who attended a Sonia Kovalevsky Day celebration (she was a famous mathematician) at Tulsa Community College. The girls were engaged and fired-up! Many girls received my book Is There an Engineer Inside You? as a prize and I signed many copies. Tulsa really rolled-out the red carpet for me! I couldn’t have asked for a better reception! This area should be unstoppable for getting girls on the fast track to a STEM career. 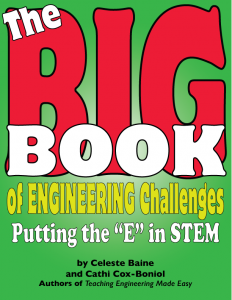 Last week, you had the opportunity to win a free copy of The Big Book of Engineering Challenges by sharing a strategy on my Facebook contest thread that you use to get students interested in learning more about engineering or STEM careers. Not many people entered so I’m giving a book away to everyone who posted something! A big **Thank You! ** to those who participated. We’ve been doing engineering design challenges for many years as part of our NIU STEM Outreach programs. One strategy that we use is to embed the challenge within a narrative that students can relate to. In short, storytelling where they determine the outcome by their ingenuity. SAME hosts engineering camps through the academies for high school students. Lets them have a chance for hands-on experience & also to network with kids their age from across the country & different backgrounds so they learn why others have an interest in engineering. Sometimes making it known that scholarships are available helps those who are worried about the cost of an engineering education. Getting kids, particularly a small group, together working a project that relates closely with another area of interest to them (designing/building a musical instrument, if interested in music, & then discussing how it could be put into wider production, can show how engineering ties into essentially everything we do. Provide information (such as from the Engineering Education Service Center) to school guidance counselors about engineering careers, particularly in areas underserved for STEM support. With the parents’ permission, of course, take the student to your workplace (&, if possible, project) to let them see what you do, how you do it, meet & talk with co-workers & then see the project in progress. Work with the student on a project that directly contributes to her community. Perhaps team with a local school & develop the project idea with their teachers, so some of the in-class experience can support the project too. I assign fun and relevant engineering challenges for my 7th grade science class every chance I get. Last one was to build an human arm while studying muscular and skeletal systems. We then watched videos and read articles about how engineers develop prosthetics. I believe feeling like an engineer makes engineering careers more approachable for middle schoolers. I like to teach new vocabulary or present a real world issue to my students then have them come up with ways to fix it. They’re currently trying to build water filters to clean polluted water. A few weeks ago we were learning about buoyancy and density. They designed boats, we sunk them then discussed why some sunk faster than others. They LOVE STEM! Teaming with another teacher in the school to help the kids develop an engineering solution to an issue in that other subject areas, such as some event in history — find a different way to solve it than what actually happened. Just to talk with students about engineering + why it’s important. Lots of good suggestions here. If you want to engage students and parents, recruit for your engineering classes or motivate students, these workshops are the answer! Below is table that outlines two events that can help you promote engineering and/or STEM careers. Of those polled, 96% of students that attended say they are now considering an engineering (or STEM) career. All available dates in 2016 are listed in our new online booking system. Jump aboard now because the train is already moving. Who attends Parent or guardian and middle school son or daughter. *Ages can range from 5th-10th grade. Usually Mother and middle school daughter. Can also be a Parent/Daughter Day so that either parent can attend. *Ages can range from 5th-10th grade. Number of attendees Up to 40 teams of parents and children. Up to 40 teams of mothers and daughters. Time of event Most often, this event is held on a Saturday morning from 9:00am-1:00pm or 10:00am-2:00pm. Mini sessions can also run from 5:00-8:00pm on any night of the week. Most often, this event is held on a Saturday morning from 9:00am-1:00pm or 10:00am-2:00pm. Mini sessions can also run from 5:00-8:00pm on any night of the week. Celeste Baine's Responsibilities She will bring all materials needed to engage no more than 40 parent/child teams in hands-on engineering activities for the entire workshop. Activities are customizable but usually include solving problems, building tabletop hovercrafts, designing catapults, helmets or cranes. She will also bring prizes, and a copy of Is There an Engineer Inside You? for each student. She will bring all materials needed to engage no more than 40 mother/daughter teams in hands-on engineering activities for the entire workshop. Activities are customizable but usually include solving problems, building tabletop hovercrafts, designing prosthetic hands, helmets or cranes and placing a band-aid on a Whale. She will also bring prizes, a take-home engineering kit and a copy of Is There an Engineer Inside You? for each student. Host Organization's Responsibilities 1. Provide the workshop location. 2. Marketing, inviting and registering students and parents. 3. Provide morning snacks and lunch. 1. Provide the workshop location. 3. Provide morning snacks and lunch. Host one of these very popular workshops in your community! In addition, if you want to have many of these workshops at your location (a very good idea), attend one of our Train the Trainer workshops to get on the fast track to offering this extraordinary opportunity. An advanced training is also in the works for 2016. For more information, download our event planning guide or email Celeste. Win a free copy of The Big Book of Engineering Challenges by sharing a strategy on my Facebook contest thread that you use to get students interested in learning more about engineering or STEM careers. We are giving away five books. The winners will be chosen at random. You can enter once per day. Winners will be announced on Monday, November 16, 2015. Note: For every 100 comments, I will give away an additional five books! Increase your chance of winning by inviting your friends and colleagues to participate! Last week you had the opportunity to win a free copy of Robot Makers: An Essential Guide to Choosing a Career in Robotics. All you had to do was respond with one word that described a robot. The winner was chosen at random from all of the entries received. Omar Brown from Chaminade Julienne Catholic High School! The words sent in to describe a robot are below. Do any of them change your perception? I’m about to make the most amazing offer that I’ve ever made. It’s free and there are no strings attached. You even get to take home an Engineering PowerPack and classroom materials kits such as the Prosthetic Hand and Protect Your Noggin. Almost $600 worth of materials totally free. Are you in? There are only 10 instructor slots available. First come, first serve. How it works: On Monday, you will learn several activities while the girls do ice breakers, watch videos and interact with other facilitators, a college engineering student and several high school students. From Tuesday-Friday, armed with the activities you learned and constructed on Monday, you team facilitate the activities with the girls. During the week, when the girls have a field trip, watch videos, or listen to panel discussions (basically every spare minute), you go back into training. When the girls go home, we will refine the activities and discuss integration into your classroom or situation. Historically, by the last day of the camp, 95% of the girls said they wanted to be engineers! You will go back to your classroom with increased confidence and bundles of materials to implement more engineering education into your instruction. Audience: Late Elementary, Middle and Early High School Teachers, 5 days- 7 hours each day. On our website, in addition to Kits, Blast Packs, Books, DVDs, Rubber Stamps, Pins, Presentations and Labs are resources for students, parents, teachers, schools, and mentors. With summer on the horizon, now is a great time to explore engineering career paths and supporting opportunities. Summer Camp Directory – If you have a camp you want to add to the list, simply send us a listing, formatted similar to the others, and we will post it. There is no cost for camps or families. Competitions – K-12 engineering, robotics and technology competitions. Engineering Scholarships – This page will always be under construction as new scholarships become available and current scholarship are awarded. Bookmark this page so you can come back often and check for recently available opportunities! If you know of any available scholarships not listed on this page email us and we will list it here. Women in Engineering Programs – Directory of colleges with Women in Engineering program offices. Directory of Engineering Programs – There are many factors to consider when choosing a college program. One of the most important is whether or not that program is accredited. Accreditation assures that a program has met certain quality standards. To employers, graduate schools, and licensure and certification boards, graduation from an accredited program signifies adequate preparation for entry into the profession. In fact, many of these groups require graduation from an accredited program as a minimum qualification. Directory of Engineering Technology Programs – Directory of colleges that offer associate and bachelor degrees in engineering technology. Engineering Society Directory – Find support, scholarships and guidance for your degree choice. 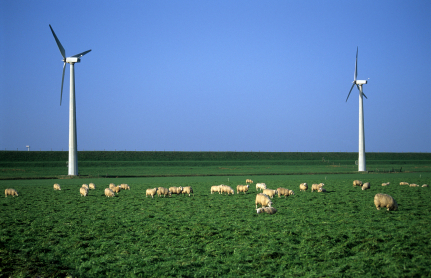 Other Links and Resources to All Things Engineering – Everything else! Would you be interested in reviewing Robot Makers? If you have a blog, a newsletter, magazine, ezine or website and would be willing to write and publish a review of this new book, just drop me an email with your address and I’ll send a copy your way. 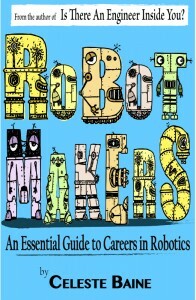 If you want the book, along with a PowerPoint you can customize and use to talk about careers in robotics, order from the EESC before May 1st. Build what? A robot of course! You may know about robots because you watched a deadly cyborg try to take over the world on television. Or, you are involved in or have seen a robotics competition, played with a Mindstorms LEGO set, or attended a science, engineering, or maker event. Although there are many definitions of a robot, in Robot Makers: An Essential Guide to Choosing a Career in Robotics, a robot is defined as an electromechanical device that can react to its environment and perform operations either on a tether by remote control, autonomously by wireless or Bluetooth connections, or as a hybrid of the two systems. In Robot Makers: An Essential Guide to Choosing a Career in Robotics, you will learn about working in the field of robotics, how it is exciting, and how it is getting more so every day. Because of technological leaps in the computer industry, many new opportunities are emerging. Engineers, programmers, and technicians design and maintain robots, research new applications for robots, and assist people in doing tasks that are less desirable. As such, robots have enormous potential for society. Equipped with the proper sensors, robots can inspect the quality of meat, measure the pollution emissions of manufacturing plants, assist in surgery, detect corrosion in sewer pipes, investigate the depths of a volcano, or assess the speed of a tornado. Robots can be used to improve the standard of living and provide more information about the planet or even the solar system. Robot Makers explores the possible opportunities available for a career in robotics. It offers and provides students with information to help them determine the course of study they should pursue in high school as well as through college helping each student to make a career choice that will be rewarding as well as offer a life-long learning experience. Visit the Engineering Education Service Center today to acquire your pre-publication copy of Robot Makers: An Essential Guide to Choosing a Career in Robotics. While there, you can review the table of contents and read a free sample of Chapter One. Take a few extra minutes to visit the other services offered at the Engineering Education Service Center (EESC). The EESC is an engineering education company that specializes in providing products for K-12 schools to teach and share the fun of engineering. From curriculum to books, DVDs, kits, apps and other motivational products, the EESC aims to make engineering understandable and accessible to everyone. Everyone who orders before the May 1 publication date will receive a PowerPoint presentation on “Choosing a Career in Robotics” that you can use to talk to students about the available career choices. It’s colorful, graphically powerful, and is designed to save you time. As an extra bonus, on this particular PowerPoint, there are no copyright restrictions – it’s yours to use freely. You can edit it, pass it around or post it online – it’s up to you. For everyone who orders at least four copies (every library needs a copy), you will receive a Textrix Remote Control or Tetrix Autonomous Robotic Engineering Activity Guide. These guides, published by Pitsco and valued at $39.95, help students learn about robot engineering, simple machines, torque, power, and problem solving. Activities guide students in creating robots that draw, dance, herd golf balls, and more. These full-color guides can be used alone or as a supplement to current curriculum. Supplies are limited. One book per customer. I refer to Is There an Engineer Inside You? as my firstborn and the genesis of who I became and what I do today. I began writing it when I was struggling in engineering school. It’s the book that I wish I’d had when making the decision to go to school. That was back in 1997. The first edition was released in 1999. In 2000, the book was the #1 Engineering Career Guide at Amazon.com and I was asked to speak at a NASA conference. Sixteen years later, I’m proud to say that it’s in the fourth edition and now published in not only the U.S. but also India and China. Seventeen colleges, schools, and organizations partnered with me last year to give away thousands to copies to students who want to be engineers or are considering an engineering degree. It’s been, and continues to be, an amazing ride! At long last, my new book, two years in the making, is finally ready! Robot Makers: An Essential Guide to Choosing a Career in Robotics is here and ready to help students choose a career in robotics. Robot making is a practical and engaging way for students to learn STEM subjects. Robotic competitions allow students to apply the skills inside or outside of the classroom. The experience is ideal preparation for entering the workforce, which is why participating students are frequently offered internship and employment opportunities while still in school. If you have students that build robots, enjoy the experience and want more, Robot Makers is essential to helping them learn about the abundant opportunities in robotics, the many types of robots, what robots can do for us, what degree is needed to work as a roboticist, and how much money they can make. The careers that support the industry offer opportunities to be creative and are challenging, prestigious, and satisfying. In my excitement to share this title, I have two special give-aways for my readers. Everyone who orders before the May 1 publication date will receive a PowerPoint presentation on “Choosing a Career in Robotics” that you can use to talk to students about the available career choices. It’s colorful, has great pictures, and is designed to save you time. As an extra bonus, on this particular PowerPoint, there are no copyright restrictions – it’s yours to use freely. You can edit it, pass it around or post it online – it’s up to you. For everyone who orders at least four copies (every library needs a copy), you will receive a Textrix Remote Control or Autonomous Robotic Engineering Activity Guide. These guides, published by Pitsco and valued at $39.95, help students learn about robot engineering, simple machines, torque, power, and problem solving. Activities guide students in creating robots that draw, dance, herd golf balls, and more! These full-color guides can be used alone or as a supplement to current curriculum. Supplies are limited. One book per customer. The Table of Content and a Glimpse of Chapter One are Online. Yesterday I had the honor of attending a meeting for the new Oregon Girls Collaborative Project. Back in 2000, I became a champion on the board of the National Girls Collaborative Project. I’ve watched the project grow over the years and now, there is a program in Oregon. It’s great to see it so close to home. The meeting was about Exemplary Practices for Engaging Girls in STEM. One of the major features was SciGirls. 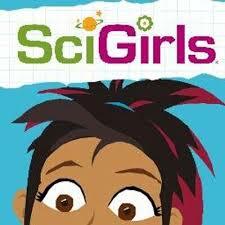 If you aren’t familiar, SciGirls is a PBS tv show for kids ages 8-12 that showcases bright, curious real tween girls putting science and engineering to work in their everyday lives. Each half-hour episode follows a different group of middle school girls, whose eagerness to find answers to their questions will inspire children to explore the world around them and discover that science and technology are everywhere! The SciGirls approach—for the TV show, website, and educational materials—is rooted in research about how to engage girls in STEM. A quarter of a century of studies have converged on a set of common strategies that work, and these have become SciGirls’ foundation. These strategies are the SciGirls Seven. Girls benefit from collaboration, especially when they can participate and communicate fairly. Girls are motivated by projects they find personally relevant and meaningful. Girls enjoy hands-on, open-ended projects and investigations. Girls are motivated when they can approach projects in their own way, applying their creativity, unique talents, and preferred learning styles. Girls’ confidence and performance improves in response to specific, positive feedback on things they can control—such as effort, strategies, and behaviors. Girls benefit from relationships with role models and mentors. When designing programs to engage girls, the SciGirls Seven is a great place to start. 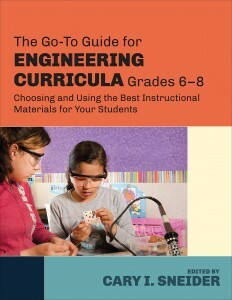 Highly recommended, Go-to-Guides are also available for elementary and high school. “Yes, and boys too.” I said. I sat there for a few seconds with my mouth open, unable to form words. I knew I couldn’t change her perception of engineering in the space of a party without getting crazy and without enough time. In addition, her daughter was now in her late twenties with children so no immediate change in behavior would change the trajectory of her daughter’s life. I stared at the floor as she went back to talking about sheep. How I wish she and her daughter had the opportunity to attend a Mother/Daughter TEA Workshop all those years ago. The event is a great education for mothers too and provides the support for a daughter to pursue a STEM career. In many workshops, I’ve had mothers approach me and ask if it was too late for them to become engineers. I’ve heard countless stories from mothers about how an event or person steered them away from engineering but now, they wanted to try again. We don’t have to let history repeat itself. In the Mother/Daughter TEA workshop, mothers will see that their daughters make great engineers. The idea that engineering is only for people that think like men is skewed and outdated. Exposing mothers (or both parents) to engineering and to how her daughter can have a meaningful, prestigious and lucrative career is the one of the goals of the Mother/Daughter TEA workshop. They will understand the large range of career possibilities and see how and where their daughter’s talents fit. For any girl, having her mothers support can not only build a stronger relationship but can also increase her self-confidence. This event can provide the scaffolding to pursue her dreams. The Mother/Daughter TEA is a 4-hour hands-on engineering workshop, usually on a Saturday morning, held in your community. If you aren’t doing these or planning one, contact me for more information. I still have about 10 Saturdays available this school year and would be happy to help you jump start an engineering program or recruit for your classes next year. If you want to promote engineering and/or STEM careers, below is table that outlines two of the best workshops you can offer students and parents. Of those polled, 96% of students that attended say they are now considering an engineering (or STEM) career. If you want to engage students and parents, recruit for your engineering classes or motivate students, these workshops are the answer! All available dates in 2015 are listed in our new online booking system. In addition, if you want to have many of these workshops at your location (a very good idea), attend one of our Train the Trainer workshops to get on the fast track to offering this extraordinary opportunity.